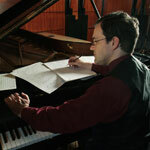 Composer Lawrence Dillon has produced an extensive body of work, from brief solo pieces to a full-length opera. Although he lost 50% of his hearing in a childhood illness, he began composing as soon as he started piano lessons at the age of seven. In 1985, he became the youngest composer to earn a doctorate at The Juilliard School, and was shortly thereafter appointed to the Juilliard faculty. Dillon is now Composer in Residence at the University of North Carolina School of the Arts, where he has served as Music Director of the Contemporary Ensemble, Assistant Dean of Performance, and Interim Dean of the School of Music. He was the Featured American Composer in the February 2006 issue of Chamber Music magazine. Dillon’s music, in the words of American Record Guide, is “lovely...austere...vivid and impressive.” His works are recorded by Albany Records, Channel Crossings and CRS, and published by American Composers Editions. In 2009-2010, he has premieres by the Emerson String Quartet, the Cassatt String Quartet, the Mansfield Symphony, the Boise Philharmonic, the Salt Lake City Symphony, the Daedalus String Quartet, the University of Utah and the Idyllwild Symphony Orchestra. Three disks of his music are due out in 2010 on the Bridge, Albany and Naxos labels. Lawrence Dillon is represented by Jeffrey James Arts Consulting.